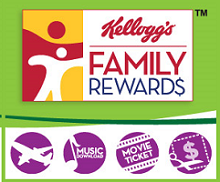 mommy's reviews: 150 FREE Kelloggs Family Rewards Points! I wanted to let you all know that there are 150 FREE Kelloggs Family Rewards Points available and I wanted to share them with you today. Here they are! Thank you! These code are fun to put in and receive points for!